This waffle make was a great kitchen add for my entire family. 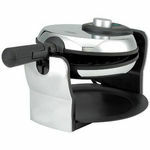 It heats up quickly and cooks the waffle fast and evenly. Just a squirt of spray butter or cooking spay on both sides and fill bottom side with batter about 3/4 level and close, flip and in about 2 minutes it's fluffy and golden brown. Convient for just 1 waffle or waffles for the entire family. Quick clean up w a warm soapy cloth while still warm. I like this product. It is decent quality for the price paid. It's inexpensive but not the best quality of product. It gets the job done. I was looking for a waffle iron that would be small, but mighty. I like this Oster brand of waffle maker. It is working fine for me and my family. 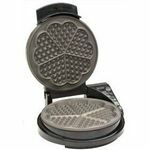 I have been using a homemade waffle recipe that calls for one egg--it makes really fluffy light pancakes and they cook up soft and not too crunchy in this waffle maker. 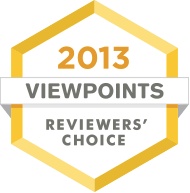 I know there are some negative reviews out there but we have been satisfied with this product so far. Its a waffle maker, it makes waffles. It doesn't stick or burn for me. I find it easy to use and easy to tell when it is warm, done and good to go. I have two kids who eat waffles, so we make waffles on Sunday mornings. My older daughter is learning to cook and she is able to use this waffle iron with me just supervising. I recommend this waffle maker for ease of use, simple cleaning. It is a little awkward to store, just the shape of it so that could be a downside for some people. Tastes great but frozen is easier! My family loves fresh waffles in the morning and as a desert. We had seen this waffle maker at our hotel this summer as part of the continental breakfast. There, it was quite easy to use as they had the batter premeasured. Also, I wasn't worried if the batter poured over as there were several women there ready to clean it up. I had a gift certificate to a local home goods store and so I purchased this one, seeing that it had such rave reviews here on Viewpoints. I do agree that the taste of the waffles from a waffle maker are far superior to that of frozen waffles. However, this can be very messy. Often the light will turn off but when you open it you have a gooey half cooked waffle on your hands. When they do come off they are delicious. Performance The main issue I have with this waffle maker is the light going off prematurely and the waffle mix is still soupy. Usually you can turn it back on and finish cooking the waffle but that always leads to spillage. You also have to be on top of spraying the waffle maker after each waffle. This is the only way to ensure that the waffles will slide off the maker. Settings/Features This isn't a complicated appliance. The light and the release handle make it pretty simple to operate. Ease of Cleaning If you spray the waffle machine enough it can be easy to clean. However this can be difficult to clean off the residue waffle if you do not coat the plates. I had to soak it several times in order to get the waffle off. Ease of Use Once you learn the right amount of batter to put on the plates it can be very easy. What I still struggle with a little bit is the cooking time. Sometimes the light will go off but when you open the pans the waffle is still gooey. It's a little trial and error. Durability Other than the coating on the pans not being as slippery as they once were, the waffle maker is still working pretty well. My husband and I registered for this waffle maker for our wedding shower, and I'm really glad we did. We have been married 6.5 years and this baby is still going strong. We don't use it every day - perhaps once a month, but I am very pleased with how well it is holding up for the price. It is very easy to use and cook with, the cleaning part is probably the only real downfall. We have learned the trick though to put wet paper towels over the hot iron part, let it set for a few minutes, and then any mess easily wipes away. There is a little knob on top that allows you to control the level of "doneness" - and a light that shows if the iron is hot enough or not ready. The trick to this is probably not to overfill it, and to only open it when you're sure that you have cooked your waffle long enough. Overall, I am very happy with this waffle maker and can see it lasting for many years to come. It's pleasing to look at, and I don't mind keeping it out in my kitchen, easy to use and not HORRIBLE to clean. Great product for the price! We purchased this waffle maker originally because it looked good and the price was reasonable. It has done a great job at making waffles. I love the pan underneath the maker that catches any overflow batter. It is removable and super easy to clean. The dial allows you to customize how light or dark you want your waffle. My only complaint with this maker and why it doesn't receive a 10 rating from me is that it doesn't have a beeper when the waffle is finished. My last maker had one and it was nice so I could leave the room or start eating dinner without worrying about burning a waffle. Other than that, the non-stick surface works well and the quality is good. I also like how deep the waffles go so you really get a good thick waffle and not something super thin. Performance The maker works well and makes the waffles fairly quick. After two waffles I will spray some butter in it so the batter doesn't stick and if I do that the waffles come out of the pan super easy. Great deal, great waffles, hard to clean. This is a great little waffle maker. I make waffles almost every weekend and this device makes the process incredibly easy. 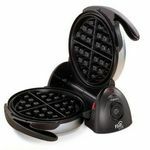 It makes noises to tell you when to flip and when the waffle is fully cooked which makes it much more convenient to use when you are multi-tasking in the kitchen (e.g. making bacon and scrambled eggs at the same time). Likewise, the Oster waffle maker allows you to set the cook time to your preference. I like my waffles a bit crispier so I typically set the time a bit on the long side. My only gripe is that the stainless steel finish is hard to clean because it's hard to get into all the spaces with a cloth. Performance Quick and easy to use. Convenience is amazing. Settings/Features You don't need any more features than this on a waffle maker. Ease of Cleaning This is my only gripe about the machine. The stainless steel gets dirty very easily! I love this waffle maker. 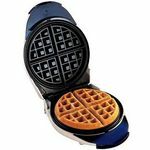 My kids love waffles and this waffle maker makes it easy to make waffles for them that taste even better than the ones they like to get at restaurants. The recipe in the book that comes with the waffle maker is the best Belgian waffle recipe I have found anywhere. I made the chocolate waffles and the kids loved them! Performance This waffle maker works great every time I use it and it is very easy to use. Just plug it in, mix up your waffle mix, pour in the batter, close the lid, flip it over and wait for the light to turn on, flip it back over, open it up, remove the waffle, and repeat the process. Settings/Features This waffle maker doesn't have a lot of settings or features. It is very simple which makes it very easy to use. Ease of Cleaning I have found this waffle maker a bit hard to clean. sometimes the waffles get stuck in the maker and makes it very hard to clean. 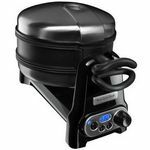 Ease of Use This waffle maker is very easy to use. It doesn't have a lot of settings which makes it very easy to use. Durability I have had this waffle maker for several years and it works great every time I use it. I haven't had any trouble with it.